Good news! Did you know that only 5 to 10 percent of all cancers (both in dogs and people) originate from genetic predisposition, and that 90 to 95 percent are caused by unhealthy lifestyles (e.g. poor diet, lack of exercise, stress, etc.) and/or environmental factors (e.g. second-hand smoke, pesticides, etc.)? In addition, it has been found that about 30 to 40 percent of all cancers can be prevented by simply changing the diet! That's right! 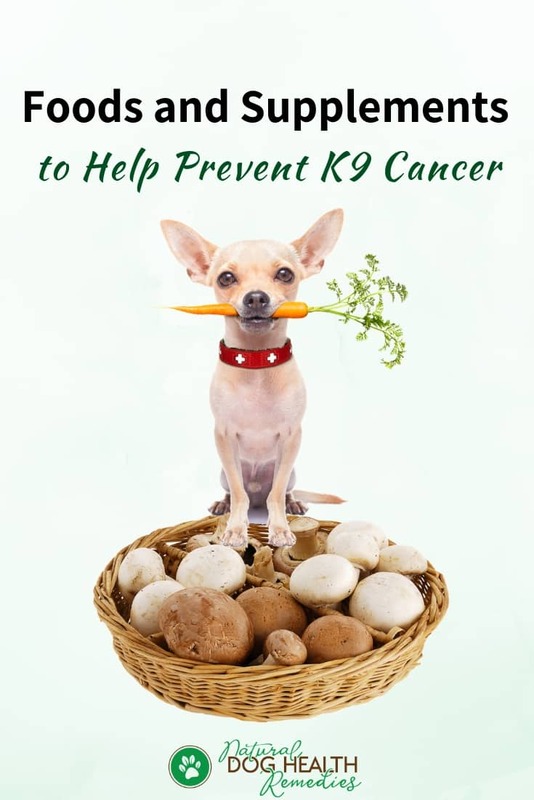 It means that helping to prevent cancer in our dogs is very much do-able. If we pay careful attention to what we feed our dogs, we may help reduce their risk of developing cancer by 30 to 40%. So... in addition to feeding our dogs a natural, species-appropriate diet, what specific foods can we give them to help prevent or fight canine cancer? Let's take a look. Here are some foods that you can easily add to your dog's diet, starting today! Berries (e.g. blueberries, cranberries, blackberries) are rich in anthocyanins, which are responsible for the blue, red and purple colors in fruits and veggies. Anthocyanins have powerful anti-inflammatory, antioxidative, anti-obesity and anti-diabetic properties. Anthocyanins are also anti-cancerous. They can reduce cancel cell growth and inhibit formation of tumors. Most dogs like the taste of blueberries and blackberries, and you can simply give these berries to your dog as treats. You can also put the berries in some plain, non-fat yogurt, mixed with a bit of raw honey. Yum! Pomegranates are also rich in anthocyanins, but the most predominant compounds in this fruit is punicalagins, which have powerful antioxidative properties. It has been found that pomegranates have anti-cancer and anti-tumor effects. Studies have found that extract of this fruit could slow down the growth and progression of prostate and breast cancer cells. Try adding a teaspoon to a tablespoon of unsweetened pomegranate juice to some plain, non-fat yogurt and serve it to your dog as a treat. You can even add some crushed-up pomegranate seeds to the mix. Cruciferous vegetables are rich in antioxidants, vitamins (A, C, K) and minerals. In addition, they contain compounds (e.g. indole-3-carbinol) that have been found to be anti-cancerous. A study showed that eating cruciferous vegetables could decrease the risk of developing lung, stomach, colon and rectal cancer in people. Cruciferous vegetables (such as broccoli, bok choy, Brussels sprouts, cauliflower) are best served to dogs slightly cooked for easier digestion. You can steam the veggies lightly and add them to your dog's food as a "topper". Alternatively, if you want to feed the veggies raw, puree them first and add the puree to the dog food. NOTE: Do NOT feed cruciferous veggies to dogs with hypothyroidism. The goitrogens released by the vegetables during digestion can increase the need for iodione and can therefore worsen the dog's condition if he has hypothyroidism. Carotenoids are the plant pigments that make certain veggies and fruits yellow, orange and red. Carotenoids are powerful antioxidants and have great anti-cancer effects. Veggies rich in carotenoids and are safe for dogs include carrots, pumpkin, squashes, sweet potatoes, kale, collard greens, to name just a few. Try to include some of these cooked veggies in your dog's meals in moderation. An occasional piece of raw carrot can also be given to your dog as a treat. Some fruits rich in carotenoids also make good dog treats. For example, most dogs would enjoy a few pieces of papaya (skin and seeds removed), banana (peeled), pieces of cantaloupe, etc. While we should not give our dogs wild mushrooms as they may be poisonous (not only to dogs but to people), certain edible medicinal mushrooms are beneficial to dogs for cancer prevention. Examples of these mushrooms include Shiitake, Maitake, Reishi, Turkey Tail. These mushrooms have been used in Asia for thousands of years to help treat different health issues, including cancer. These medicinal mushrooms are rich in vitamins (B complex, D) and minerals (e.g. selenium, potassium, iron, copper, phosphorus). It is not surprising therefore that mushrooms are powerful antioxidants and anti-inflammatories. In addition, these mushrooms are rich in beta-glucans (a type of polysaccharides), which have been found to be able to prevent mutation of normal cells into cancer cells. You can add cooked mushrooms to your dog's food as a topper, add them to your dog's bone broth, or you can get mushroom extract powder and sprinkle it on your dog's food. When getting mushrooms or mushroom extract, make sure the mushrooms are not sourced from China to avoid any possibility of harmful substances in the products. The main constituent of the spice turmeric is curcumin, which has been found to have effective anti-cancer properties. For example, this study showed that curcumin was able to kill a wide variety of cancer cells in different ways. The neat thing is, curcumin was shown to target ONLY cancer cells, leaving normal healthy cells intact and unharmed! 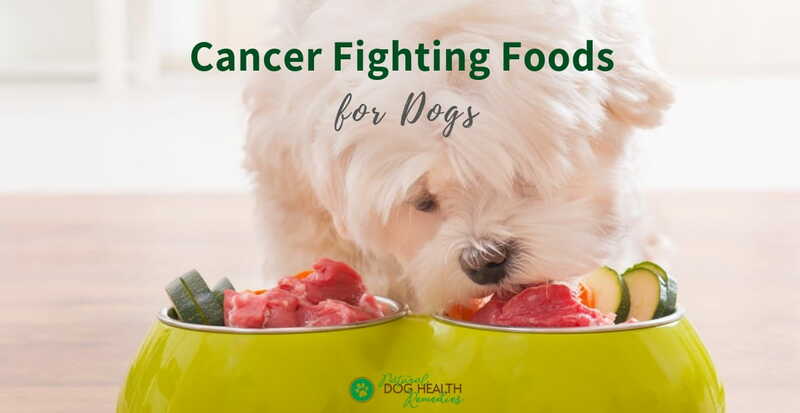 If you are interested in using turmeric to prevent cancer in your dog, visit this page for ways to include it in your dog's food, as well as for safety precautions. Ginger contains compounds that have great anti-inflammatory and antioxidant properties. Studies have also found that ginger has anti-cancer properties. A study showed that ginger extract significantly inhibited the growth of ovarian cancer cells. Another study showed that ginger extract was able to inhibit the growth and induce death of prostate cancer cells. You can add some slices of fresh ginger root when making bone broth for your dog, or sprinkle a little dried ginger powder on your dog's food. You may wonder how probiotics can be cancer-fighting. The truth is, if a dog's (or a person's) gut is unhealthy, it can lead to a host of inflammatory health issues, including cancer. Also, proliferation of "bad" gut bacteria has been associated with certain types of cancer (e.g. stomach, colon, bladder). Probiotics can maintain the balance of the gut flora, thus keeping the "bad" bacteria in check. In addition, studies (such as this one) have found that probiotics has antitumor effects and may slow or prevent various types of cancer growth. Fermented foods such as plain yogurt and kefir are rich in probiotics, and are safe to be fed to dogs. Alternatively, you can get a supplement of probiotics that is made specifically for dogs. 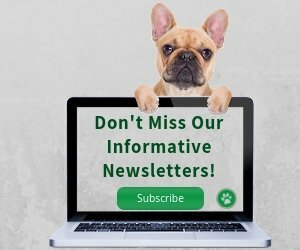 Read my article on Probiotics for Dogs for more information. 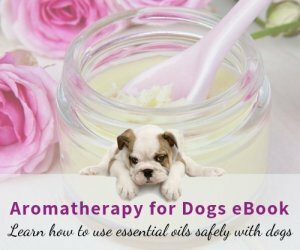 According to Dr. Messonnier (author of The Natural Vet's Guide to Preventing and Treating Cancer in Dogs), Omega-3 fatty acids can inhibit tumor formation and spread of cancer. In fact, it has been found that Omega-3 FAs can induce cancer cell apoptosis (cell death) in various ways. Fish oil (such as salmon oil, krill oil) is rich in Omega-3s. Read this article for dosage and safety precautions. Spirulina is one of those "super green foods" that is loaded with precious nutrients, such as trace minerals, vitamins, amino acids, fatty acids and antioxidants. It also has anti-inflammatory properties and has been found to have anti-cancer effects. Most dogs don't mind the taste of this green food. Just mix the powder in with the dog food and let your dog dig in! Suggested dosage for dogs is a quarter teaspoon per cup of food daily. 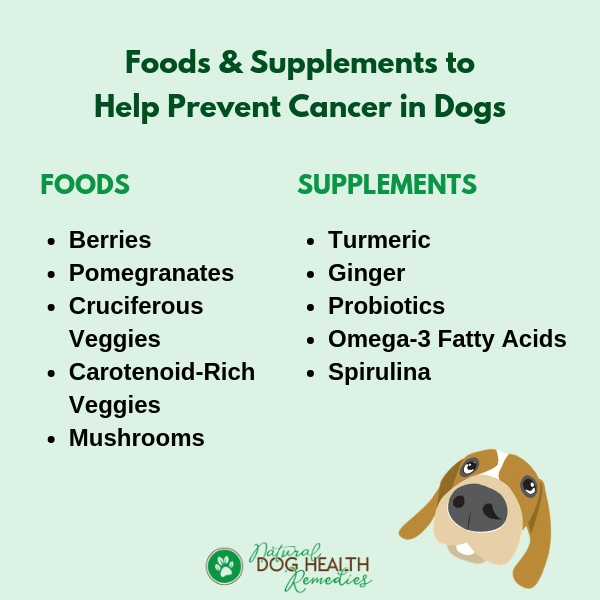 Wouldn't it be nice to have one supplement that contains most of the above "super cancer fighting foods" for dogs? Guess what? I've found one! This SPARK supplement contains a lot of the goodies that I talked about above, such as spirulina, blueberries, broccoli, turmeric, ginger, probiotics, Beta Glucans as contained in mushrooms, and much more. 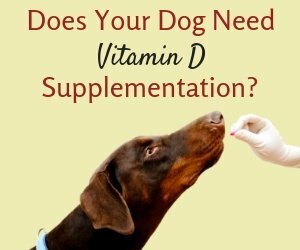 It's in powdered form and you can simply sprinkle the supplement onto your dog's food! Anthocyanidins and anthocyanins: colored pigments as food, pharmaceutical ingredients, and the potential health benefits. Mushrooms for your dog's immunity, Animal Wellness Magazine.